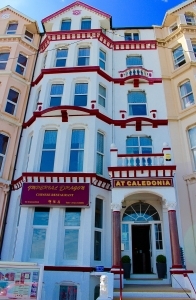 At Caledonia overlooks Douglas Bay and is conveniently situated within a fifteen-minute walk of Douglas shopping centre and the Sea Terminal. Steeped in Victorian heritage, our guesthouse is fully equipped with modernised facilities including free wi-fi, a computer room for guests’ use and lift access. Ample public free parking is available outside our guesthouse on a 24 hour basis.